Researchers from Singapore's NUS and the University of Missouri developed a new all-electric method to measure the spin texture of topological insulators. 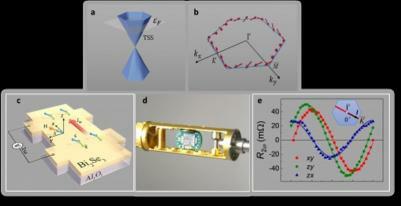 The researchers say that this method could lead to an easier (and cheaper) methods of developing spintronics devices. The new work revealed a close relation between the spin texture of topological surface states (TSS) and a new kind of magneto-resistance. The researchers observed the second order nonlinear magneto-resistance in a prototypical 3D TI Bi2Se3 films, and showed that it is sensitive to TSS. In contrast with conventional magneto-resistances, this new magneto-resistance shows a linear dependence on both the applied electric and magnetic fields. Researchers from NUS have demonstrated for the first time room temperature magnetization switching driven by giant spin-orbit torques (SOT) in topological insulator/conventional ferromagnetic heterostructures with an extremely low current density. 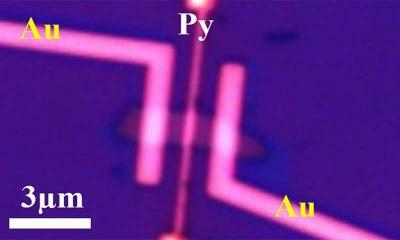 The researchers believe that such switching that uses so little power could be used to scale up spintronics devices. The researchers achieved the switching using an 8-nm layer of Bi2Se3 grown on top of a 6 nm layer of NiFe, a widely used ferromagnet. 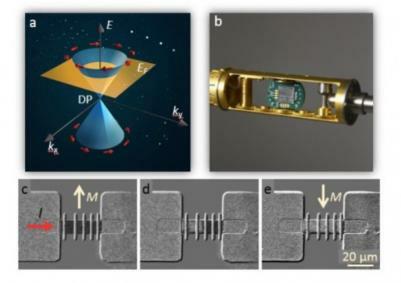 Researcherrs from Likoping University in Sweden demonstrated a method to generate and manipulate the surface spin current in topological insulators. The researchers used a combination of a topological insulator (Bismuth Telluride, Bi2Te3) and a regular GaAs semiconductor. The electrons were generated with the same spin in the GaAs using polarized light. The electrons were then transferred to the TI. Researchers from Berkeley Lab and UC Berkeley synthesized a new 2D topological insulator material, called 1T’-WTe2. In such a material the flow of electrons is completely linked to the direction of their spin, and is limited to the edge of the material. Topological insulators can be used to create "spin batteries"
Researchers from Purdue University have demonstrated how topological insulators can be used to create rechargeable "spin batteries". The demonstration showed how spin momentum locking can retain the spin even after two days without current. Spin momentum locking is an effect in topological insulators in which the spin of the electrons on the edge of the material change their spin when current is applied. The University of Minnesota (UMN) published yet another video, interviewing several researchers at the Center for Spintronic Materials, Interfaces, and Novel Architectures (C-SPIN). The topic this time is topological insulators - priming new class of materials. Topological insulators are materials in which the edges are conductive but the rest of the material acts like an insulator).